Oh me oh my: it’s a rare night when Miss Aretha Franklin doesn’t make three costume changes in her show. 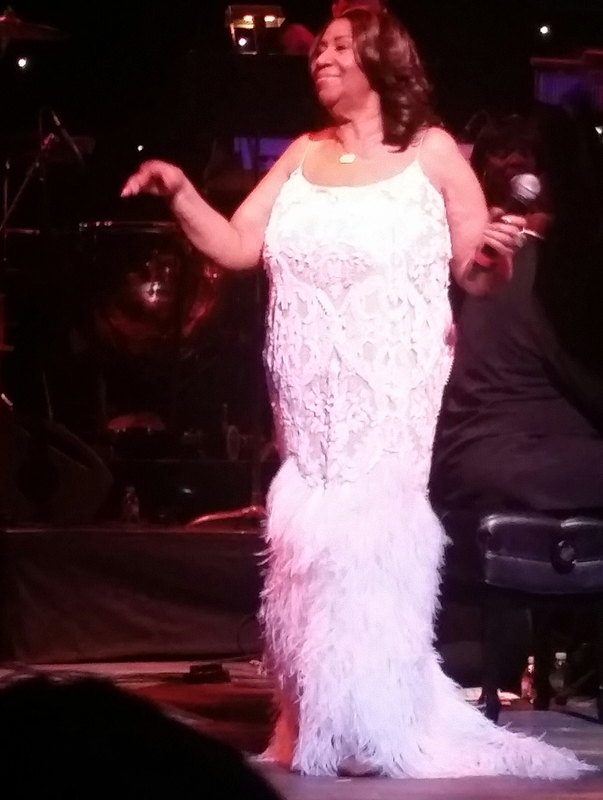 But the celebrated Queen of Soul stuck to one feathery white dress and a small boa on Saturday night at the very sold out New Jersey Performing Arts Center in Newark, New Jersey. There was electricity in the air in the grand looking but intimate auditorium, and Aretha obviously felt it. She was enjoying herself too much to waste time with different dresses. She wanted to sing and dance. And she she did. For Newark, a svelte Miss Franklin brought the legendary HB Barnum and her entire orchestra, famed back up singers (like Vaneese Thomas) and added a big horn section of local players. Her gifted keyboardist Richard Gibbs led the charge, but it was Aretha herself who fired all the shots. Was it a special tea? Lots of rest? Good rehearsal? Whatever it was, she was a vision in white just like she sings in “Freeway of Love,” ripping through her set with a ferocity and precision that was startling. We heard versions of “Natural Woman” and “I Never Loved a Man” like it was 1968. By the time she got to “Respect” it was clear she didn’t want to stop and the audience didn’t want her to, either. The encore was sung from off stage– “The Way We Were” — the effect is to keep your mind on the voice and not worry about where the Queen of Soul is at the moment. It works as well because the arrangement gives the song– which is short — a double back for emotional effect and she can scale Marvin Hamlisch’s delicious melody to a crescendo. And she asked for prayers for Bobbi Kristina Brown, the Houston family and Bobby Brown. Little did we know that the star of Newark R&B, Cissy Houston, was in the house. After the show, the two lifetime friends had a long meeting backstage. Also in the house, and dancing a little onstage with her when Aretha came back to shimmy and bop to the orchestra’s outro, was “The Wiz” director George Faison. amFAR in Hong Kong: Disgraced Robin Thicke Performs, Leonardo DiCaprio Sends a Guy Named "Gatsby"